Planning a professional event? 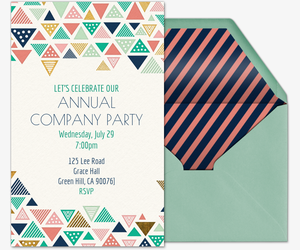 Get set to impress colleagues and clients with digital invitations from Evite. 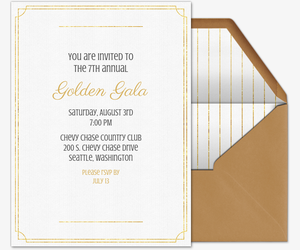 Whether you’re organizing a large-scale networking event, hosting a casual mixer, or meeting up with your sports league, our invitation collection features simple, elegant, and creative designs to fit your event and industry. 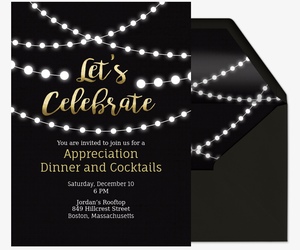 Choose from dozens of free and Premium invitations to best showcase your brand, including our Design Your Own invitations. 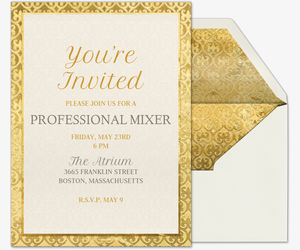 Evite’s Design Your Own invitations are the most seamless and effective way to personalize invitations for your professional event. Already have a flyer or another design for your event? Simply upload your design to our blank templates. 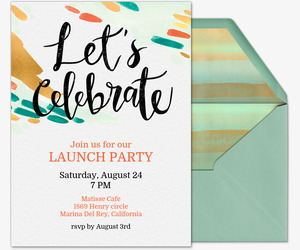 Or, customize our free Upload Your Own invitation templates with a logo or photo. 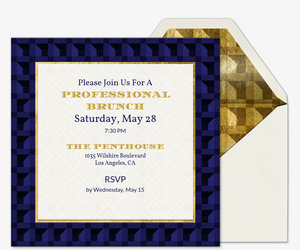 Evite Premium invitations are advertisement-free and include a matching envelope, stamps, additional photo and text cards, and enhancement features from Aviary. Pricing is based on the size of your guest list. Paperless invitations allow you to track RSVPs, manage your guest list, and socialize with guests before, during, and after your event. Looking to publicize your event? Don’t worry about an email list. You can spread the word about your event by posting your invitation’s sharable link on social media. Plus, engage with guests long after the event is over by asking them to share photos and more on your digital event page. Is your company supporting a cause? 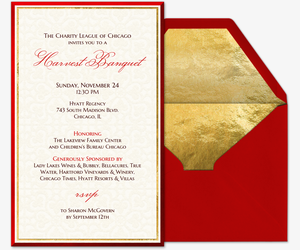 Browse our charity and fundraiser invitations. Planning a more casual event? Browse our dinner party invitations and cocktail party invitations. You can plan your personal parties with Evite, too. Check out our birthday party invitations, baby shower invitations, bridal shower invitations, wedding invitations, and more.